At Torys, our people are our greatest asset, and we are always looking for creative ways to invest in their personal and professional development. To that end, we are thrilled to announce that we have collaborated with The Rotman School of Management at University of Toronto to create an intensive Business Leadership Certificate Program, starting in February 2015, for lawyers in all our offices. We are very proud of this innovative initiative, being the first of its kind in Canada and available exclusively to Torys lawyers! drive innovation within and outside of the firm. 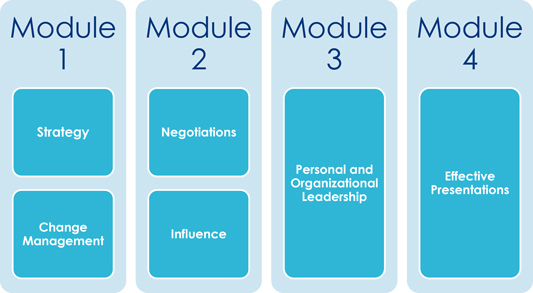 Below is a chart showing, briefly, the areas the four modules of the program will cover. For more information about the Rotman School of Management at University of Toronto, click here.